Consumer electronics devices capable of delivering high-definition (HD) video signals are growing rapidly in number and variety. DVD players and cable or satellite set-top boxes have been joined by Blu-ray players and video game consoles, with PCs, video cameras, and even mobile phones close behind. While each wave of innovation has improved video quality, it has also added to the tangle of cables connected to high-definition televisions (HDTVs) and created a need for more video inputs. We relied on MATLAB to verify our designs early in development by simulating the WHDI algorithms, and later by comparing the results produced by hardware implementations with MATLAB simulation results. WHDI is the first standard to enable universal, codec-independent, multiroom HD video connectivity through the delivery of uncompressed HD video. 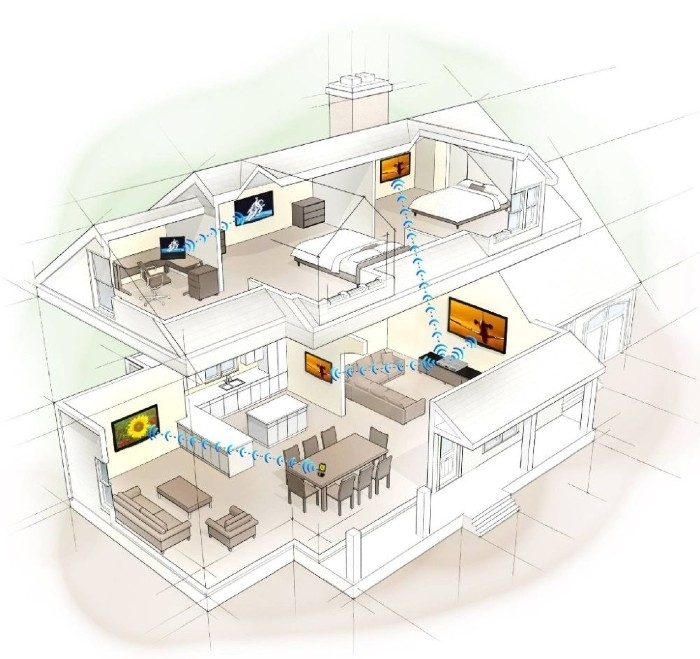 With WHDI, users can connect any video source in the home to any display device—even to a device that is 100 feet away and in another room. Because WHDI is a multi-cast protocol, one audio-video source can be connected to several displays. From an engineering perspective, transmission chains for video are more demanding than transmission chains for data packets. Data packets can be retransmitted without affecting the user’s experience. With video, there is no retransmission; each frame must be passed across the channel when the source delivers it. Because the viewer will notice any errors in the video, worst-case performance, not average performance, must be the gauge of quality. Wireless video products that use alternative technologies have significant drawbacks. Some use compression, which not only adds a significant amount of latency but also requires a more powerful and costly processor. Others transmit in the very high-frequency 60 GHz band, which requires direct line-of-sight between the transmitter and the receiver, and thus cannot be used to transmit from room to room. In addition, the 60 GHz technology does not support multicast transmission schemes in which one source is transmitted to multiple receivers. 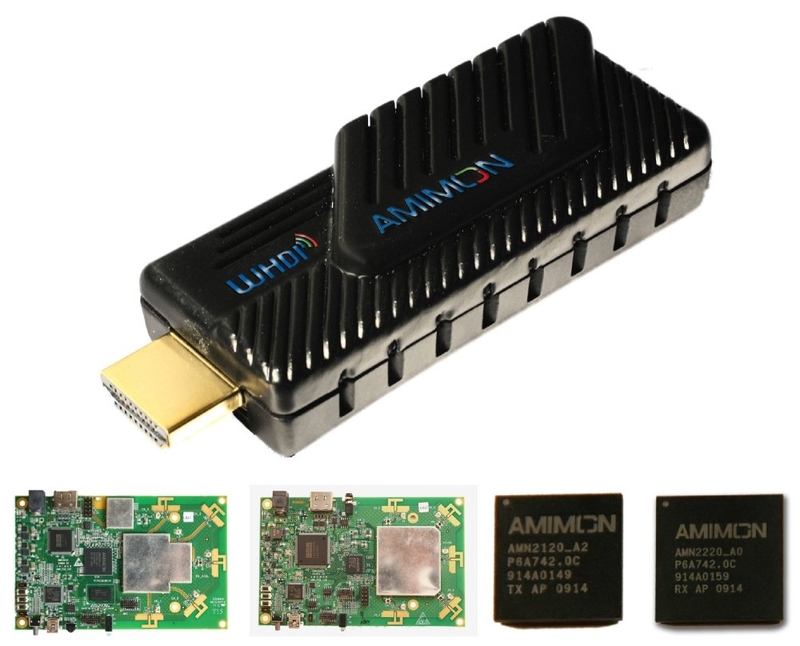 For AMIMON engineers, the challenge was to develop video processing and modulation algorithms that would enable us to transmit uncompressed 1080p frames at 60 frames per second using the 5 GHz unlicensed band and just 40 MHz of bandwidth. Because the technology we were developing was so new, we needed to try innovative techniques. The MATLAB environment is ideal for this kind of development because we can very quickly try out new ideas and run simulations to evaluate them. As a result, we were able to try several schemes that would otherwise have been too time-consuming to evaluate. For example, we needed to design a motion classifier, which detects whether an 8x8 pixel block is static or dynamic. This straightforward implementation required the last frame to be kept in memory for comparison against the new frame. This frame buffer contains a large number of pixels. Using such a large memory buffer would increase the product cost significantly. By using MATLAB, we tried several schemes that store a signature of each 8x8 pixel block. The signature from the last frame was compared with the signature from the current frame to determine whether motion was present. We tried several signatures. For each signature under test we ran simulations on real movies to quantify the false alarm rate and the miss detection rate. Figure 1a. DLPHY transmitter block diagram for 20 MHz mode and 40 MHz mode. Figure 1b. Video encoder block diagram. In MATLAB, we developed algorithms for the modulator that use multi-input, multi-output (MIMO) technology. With this design, we transmit four streams simultaneously using four separate antennas. On the receiving side we have five antennas, with the extra antenna used to compensate for fade-out. We tailored the video processing component to work with this special modulator. The video processor and modulator are further partitioned into approximately 25 functional blocks, each modeled and simulated separately in MATLAB. For example, the video processing module includes discrete cosine transform (DCT) algorithms that process frames in 8x8 pixel blocks, while the modulator includes inverse fast Fourier transform (IFFT) blocks to implement the orthogonal frequency division multiplex (OFDM) modulation. For another block we developed finite impulse response (FIR) filters using Signal Processing Toolbox™ and then used Optimization Toolbox™ to identify an optimal set of filter parameters that would bring the design into compliance with FCC regulations. Verification of our design started early. After developing the algorithms in floating point to maximize development speed, we converted them to fixed point for maximum simulation fidelity. Once a functional block was modeled with MATLAB, the engineer simulated the block by providing test stimuli inputs, capturing the output, and comparing the output with expected results. A team of six engineers developed individual blocks in parallel until the entire system could be integrated and simulated together. The input to this full system simulation in MATLAB is a single-frame image stored as a bitmap file. The simulation performs all the video processing and modulation algorithms on the transmit side and then performs the reverse algorithms on the receiver side to reconstruct the image. At the end of the simulation we verify that the resultant image matches the input image with high fidelity. During simulation we capture the input and output of individual subsystems and reuse them to verify the RTL implementation. Once a block has been tested via simulation in MATLAB, VLSI engineers use the MATLAB algorithm as a reference to develop the RTL code. Using a test-bench automation technology, the engineer then verifies the implementation by comparing the results produced by the RTL implementation with the test vectors generated by MATLAB. The RTL block is stimulated with the same test inputs as the MATLAB code, and the results are analyzed to see if they are bit-exact matched. In the next verification step we download the RTL onto an FPGA board and run the algorithms in real time on real channels using actual RF devices and antennas. On the receiver side we have a large memory bank in which we capture the input signals from the receive antennas. When we identify anomalies in the received signal, we analyze the data captured by injecting the received signal into the receiver MATLAB simulation and determining the source of the problem. This step enables us to improve our design to compensate for the kind of channel fades and noises that the device will encounter in real-life settings. Finally, we tape out the verify RTL implementation and send it for fabrication as an ASIC chip. Figure 2. Second-generation WHDI audio-video modules. Top: The WHDI Stick, which enables wireless viewing of tablet and notebook content on a TV. Bottom: Transmitter and receiver modules of a WHDI wireless video modem.